Now that the excitement of the holidays are over, I have been slowing things down and staying close to home. 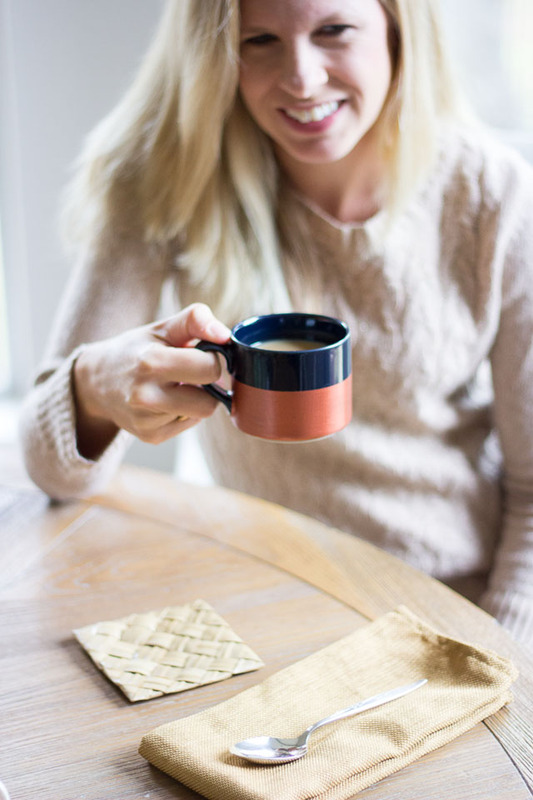 Today I’m partnering with Glade to share my idea of cozy home entertaining. Lately for me that has been sharing a cup of coffee with a friend while our kids play together in the playroom. If we can steal a few quiet moments of conversation without being summoned to help with a toy or settle a sharing dispute, I consider it a success! If I know we have friends coming over for a playdate, I try to plan ahead and pick up a few muffins and fresh fruit at the store. 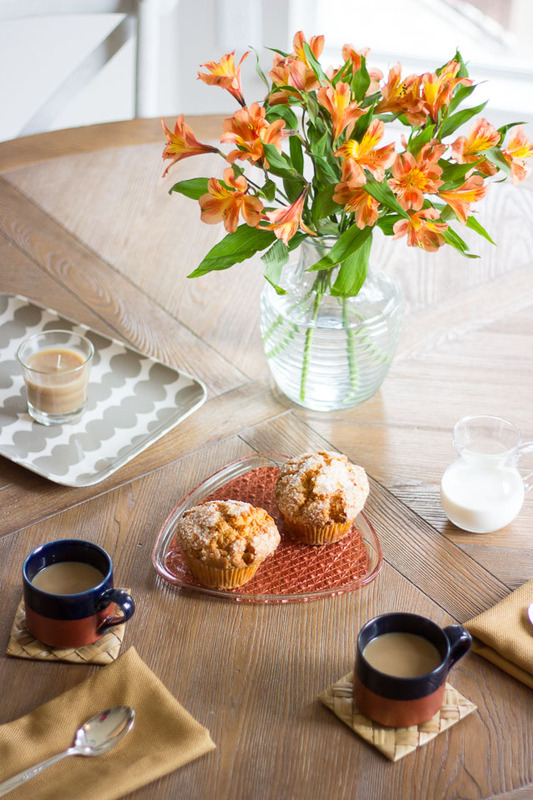 An inexpensive bouquet to brighten up the kitchen table is also a nice touch. These pretty alstroemeria are my favorite supermarket flower. Not only are the often the most affordable (this bunch cost $4), they are also some of the prettiest and last the longest. When I walk into a friend’s home and they have a candle lit, I immediately feel cozy, don’t you? I try to create the same cozy vibe in my home. Especially in the winter months, I think a candle is such a comforting sight. Glade sent me their Cashmere Woods candle that has all my favorite scents mixed together – citrus, oak, and vanilla. 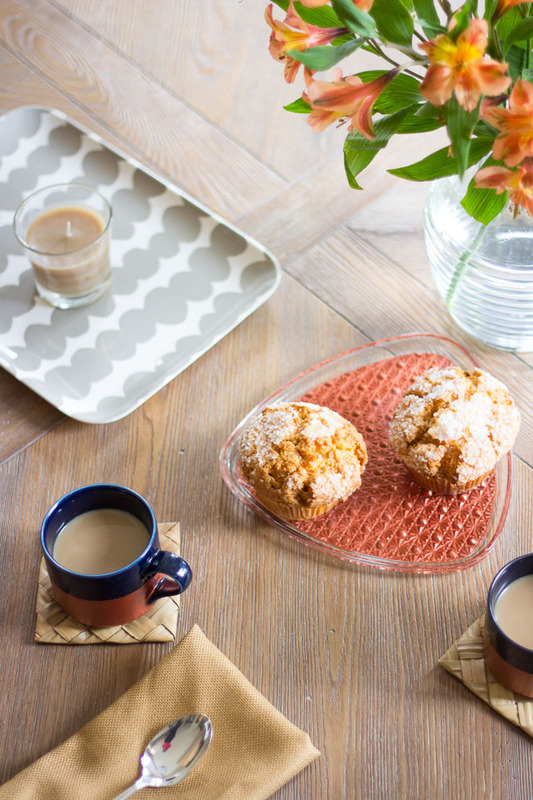 Perfect for a winter morning coffee date! 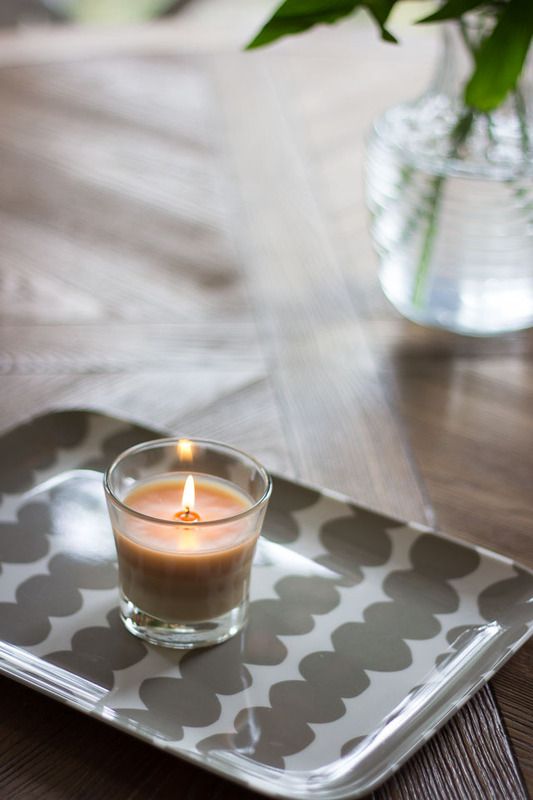 Of course, I try to incorporate a handmade component to my entertaining whenever I can! 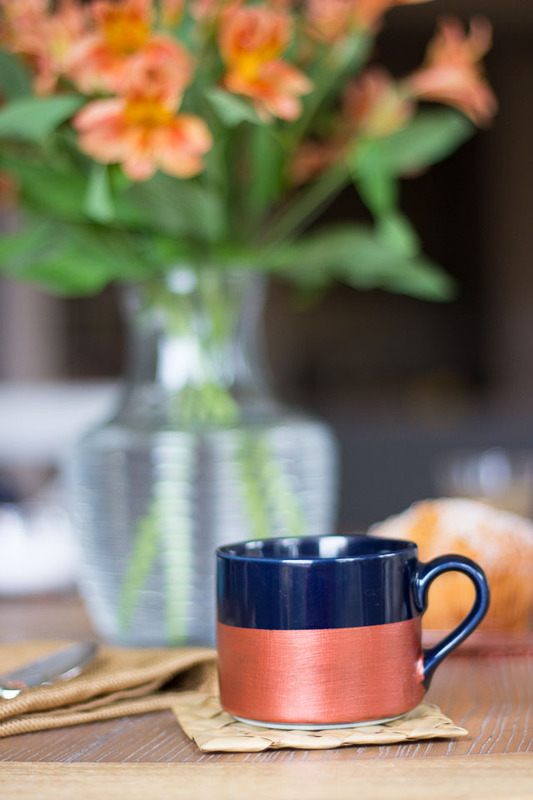 I recently gave these thrift store mugs a metallic makeover and was excited to put them to use. 1. Wash and thoroughly dry the mugs. 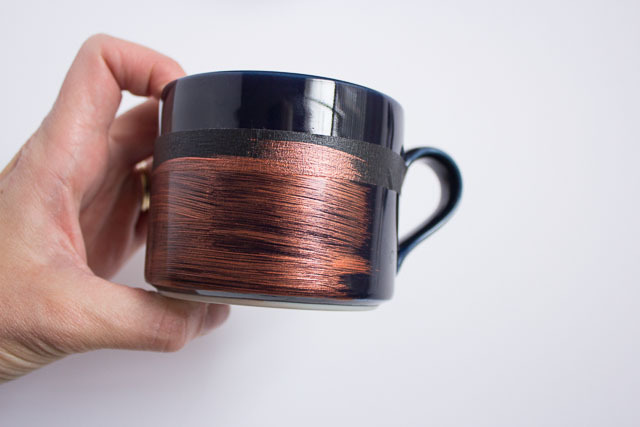 Tape off the bottom section of the mug with masking tape. 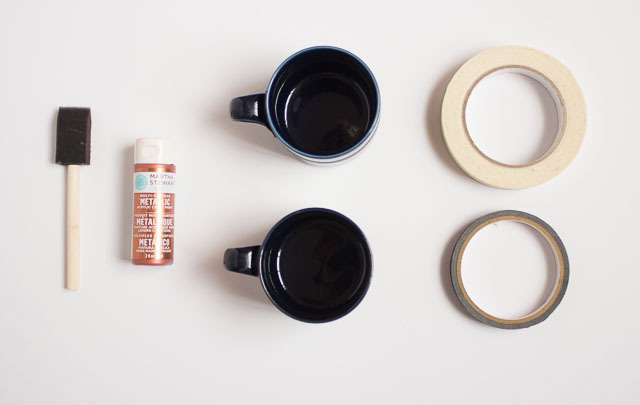 Make sure you position the tape low enough so that your mouth doesn’t touch the painted area when you take a sip! Also be sure to tape off any of the handle that you don’t want covered in paint. Run your fingernail along the edge of the tape to prevent any paint from seeping underneath. 2. Use your foam brush to apply an even layer of paint to the area below the tape. Let the first coat dry completely before adding another coat (the directions say to wait an hour between coats, but I probably only waited 30 minutes!). I covered the mug in 4 coats, changing the direction of the brush strokes with each coat to create a smoother surface. 3. 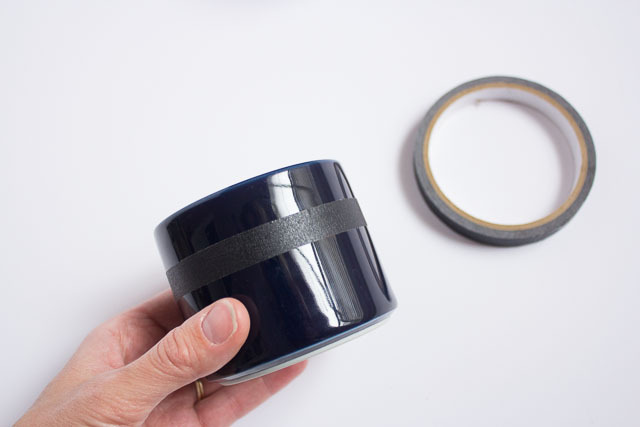 After your last coat, carefully peel off the tape, peeling away from the paint. For the Martha Stewart paint, you need to let it cure for 21 days. UPDATE: The paint says it is dishwasher safe, but mine came off in the dishwasher after a wash, so I would definitely hand wash and avoid scrubbing the painted area. 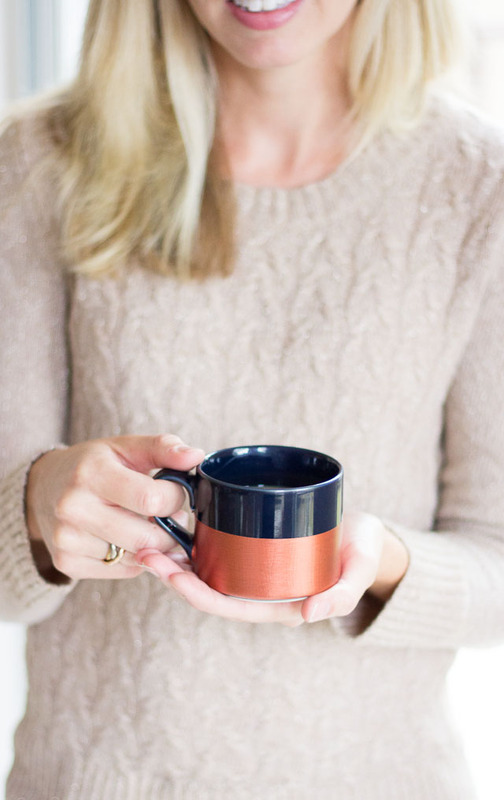 I paired my new mugs with another recent thrift store DIY project – my metallic retro plates! Thanks Glade for inviting me to share how I like to make my home feel cozy! Be sure to check out Glade’s Pinterest page for more entertaining ideas! This post is sponsored by Glade. All content and opinions are my own.